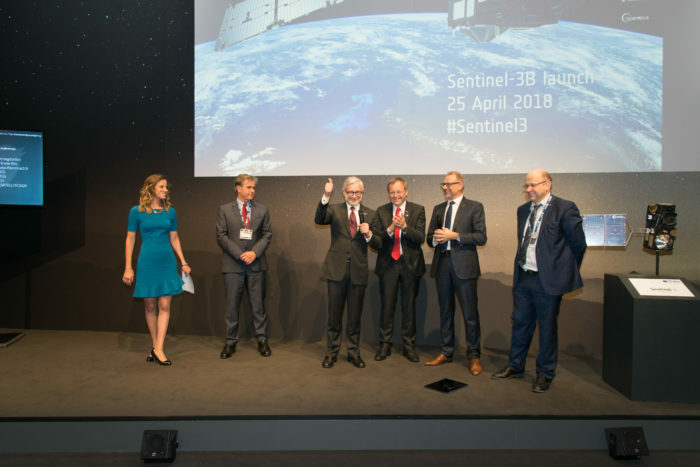 The launch of Sentinel-3B will complete the first set of satellites in Europe’s Copernicus programme. It’s primarily an ocean mission, however, the mission is also able to provide atmospheric and land applications. The launch event was held at ILA Berlin, with guests from industry, politics, institutions and media. The photo taken after a successful lift off and AOS includes: (left to right) Peter Freeborn from Eurockot, Phillippe Brunet from the European Commission, Jan Wörner, Director General of ESA, Josef Aschbacher, Director of Earth Observation Programmes at ESA, Alain Raiter, Director General of Eumetsat.